Even some of the nettle has died, along with my elderflower shrub. Some weeds though are thriving as you see. Disaster! After a few days of shock and mourning, my first instinct was to cut out the dried plants and buy some new plants. However, after thinking some more, I thought about working with climate change, instead of fighting it. Here you can see that some plants have survived- these are the plants that originated from hot climates such as the African Cala lily, the Agapanthus from South Africa, the Indian hawthorn (from Hong Kong), avocado plant and Mexican daisies- all survivors of the intense heat. In the future, we will have to get used to less water. So I thought of creating a low water garden. At present, I have decided to leave the dried bushes as they are. They are preventing seeding by weeds and also protecting the soil from getting too dry. So here is the to future- more resilient plants out on the patio! Categories: balcony, climate change, container gardening, creativity, environment, exercise, flowers, garden, herbs, houseplants, landscape, living without, organic, outdoors, saving money, seasons, sustainability, urban, waste, watering plants | Tags: climate change, concrete patio, container gardening, waste | Permalink. I have recently been diagnosed with osteoporosis. This is bad news not only because I am relatively young, but also that the disease has hit my spine. I have read a lot about the condition and how it can be avoided or its onset reduced. I have been prescribed Vitamin D and calcium tablets but it is not enough to swallow tablets. Being outside in the actual sunshine is more important. But Britain does not have enough sun all through the year and in the winter months, it is particularly difficult getting the right amount of sun every day. So as soon as I see the sun coming out, I am impatient to get out- sunshine is like precious gold, I have decided. Having seen how dog owners are quite healthy, I have been going outdoors and reading or walking for most days- even when it is raining or cold. No, one doesn’t have to have a dog to go outside- having children can help but even if you don’t have either of those, going out helps. And it certainly costs less. I also enjoy watching children playing- their joy is infectious. 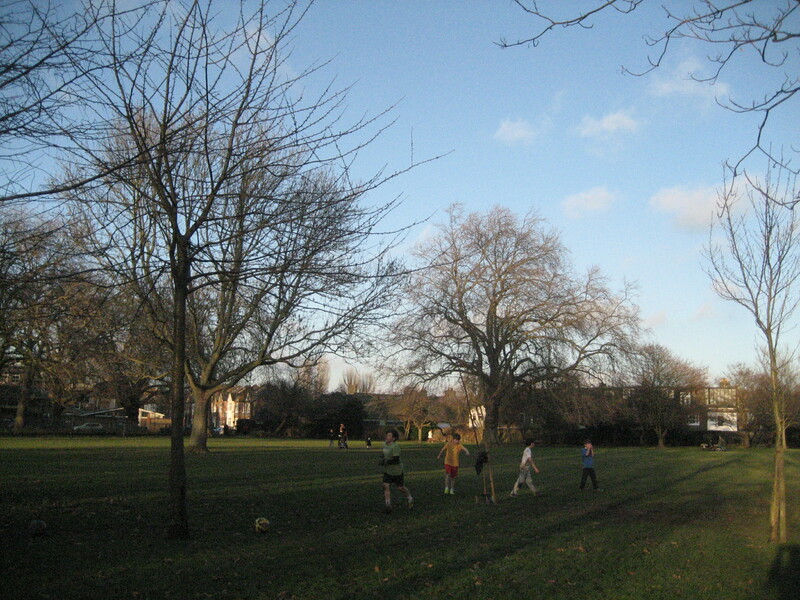 In this photo taken this afternoon, these boys were black with mud but really totally engrossed in their muddy football. It brought a smile to my face. In a recent study at the University of Exeter lead by Matthew White, it was revealed that the health benefits of being outdoors is as much as about a third of the impact of getting married (minus the costs!) and a tenth of the impact of being employed. So it shows that one does not need to be married or employed to get the benefits of being outdoors. In the Netherlands, a study of almost 350,000 people, found that the people were less likely to have 24 of 35 diseases and in Japan, another study found that elderly people were more likely to live longer if they used open spaces. The positive effects of being outdoors last longer than the euphoria that comes from winning the lottery or getting a pay rise or promotion. And with little stress involved! I remember a documentary about the children’s author, Judith Kerr, who is now 93. Come any weather, she talks a walk for two hours every day. How amazing she looks and how creative she is. Engaging with nature influences our mental being by raising our spirits and exercising our mental abilities. Many mover and shakers and authors have described how their creativity is helped by walking- Thoreau, Gandhi, and many others along with Kerr were walkers. Further, walking is in streets is better than no walking- the health benefits of a weight bearing exercise like walking outweighs the risks from pollution. So get your precious gold today- one doesn’t need a dog! Categories: exercise, health, outdoors | Tags: beneficial, benefit, children, exercise, Exeter, Gandhi, Judith Kerr, longevity, osteoporosis, outdoors, Thoreau, walking, weight bearing | Permalink.